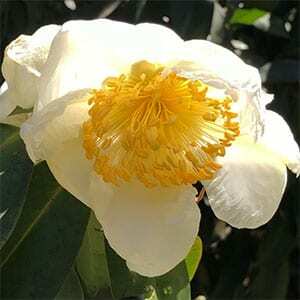 A wonderful flowering tree, Gordonia plants, especially Gordonia Axillaris will flower when very young. Lovely white flowers with a bright yellow centre make these plants a stand out in the garden. Gordonias are an evergreen plant originally from China and are actually related to Camellias and Stewartia. It is Gordonia axillaris that is best know, a medium sized tree that will reach around 5m in height. Over time it forms a nice domed canopy and the combination of lovely glossy foliage and great flowers make this a great garden tree. G .yunnanense probably has the nicer flowers and with darker foliage really shows of the ‘fried egg’ flowers that appear during spring. Both are commonly known as the ‘Fried Egg Plant’ these are an upright evergreen tree with the large flowers during early summer. These are a tree that require a humus rich moist soil to grow well. Mulching around the plants will assist with retaining moisture and maintaining a cool root run. A general purpose fertiliser can be used in spring, a camellia and rhododendron fertiliser works well. These are a tree that have a naturally tidy growth habit, so pruning is not generally required. You can prune these plants to create a semi formal hedge if required. Gordonia species are being used as street trees in some areas. They are an excellent shade tree for smaller gardens and you can lift the canopy a little by pruning away some of the lower branches if required. Lifting the canopy allows more light into the garden for understory plants as well as easier access for mowing or on parthways. G. axillaris – Gordonia axillaris is know known as Franklinia axillaris but still widely sold as Gordonia axillaris.